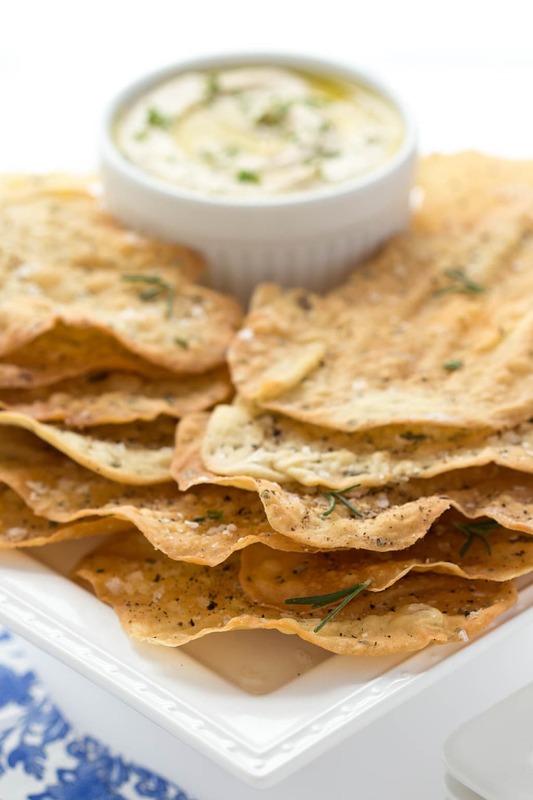 These shatteringly crisp Lemon Rosemary Flatbread Crackers are perfect with hummus and dips but also pair well with salads and soups. 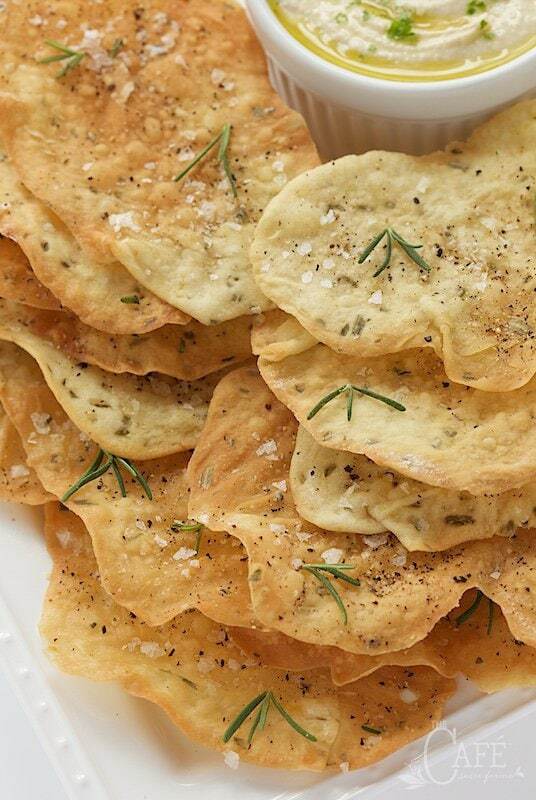 Every time I serve these Lemon Rosemary Flatbread Crackers, people go crazy. Two texts that I received recently explain what I mean. The first one was from my sister, Annie after a get-together a while back. I had served these crackers for an appetizer paired with hummus. The day after Annie returned home, I got this text : “I’m making your crackers… dough is rising :)” I had to laugh – Annie and I are cut from the same cloth. When I try something new and really love it, I can hardly wait to get back home and make it myself. So how could I not share these crazy good Lemon Rosemary Flatbread Crackers with you? I made another batch today for some company we’re having next week (they keep very well) and Scott shot a few pics of the process, as well as the results. They’re not difficult, especially if you have a stand mixer. I let the dough hook do all the kneading work. Then it’s hands-off time while the dough rises. You want the dough to double in size which takes anywhere from 45-60 minutes, depending on how warm your kitchen is. I read a fun tip recently on how to know when it’s double in size – take a picture with your smart phone before it rises then you can determine easily when it’s doubled. Here’s another great tip I figured out many years ago. If you’re kitchen is chilly, or you just want to speed up the rising time of your dough, boil some water in a Pyrex cup in the microwave. When it’s nice and warm and steamy inside, place your bowl with the dough inside the microwave (keep the water cup in there too), covered with a clean kitchen towel. Let the towel hang out of the door a bit and close it lightly. 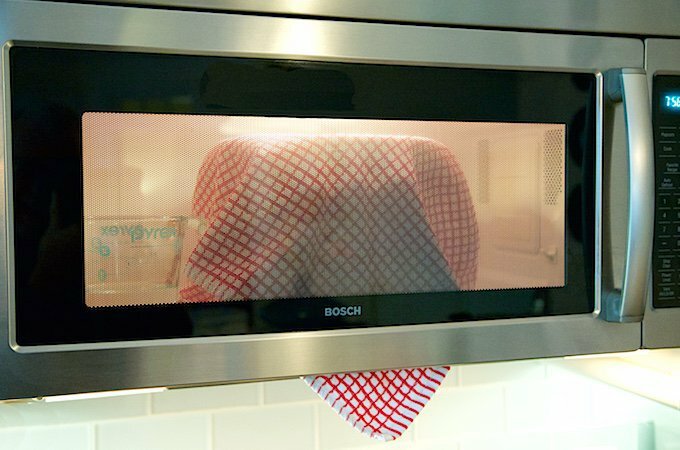 The towel in the door, will keep the light on in the microwave – which creates the perfect warm (but not hot) environment for your yeasty dough to rise! Just don’t turn your microwave on, or you will have guaranteed unwanted fireworks! 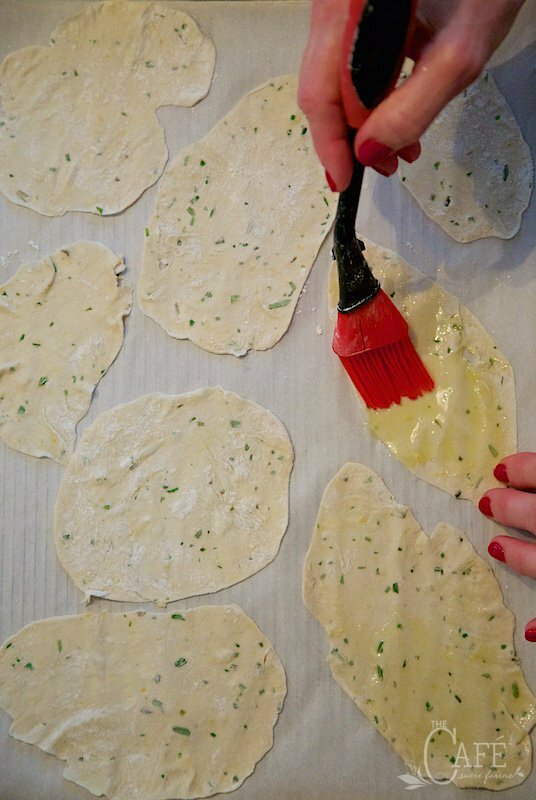 Yes, you will need a rolling pin, as these Lemon Rosemary Flatbread Crackers are rolled super thin. Then they’re transferred to a sheet pan where they’re brushed with olive oil and sprinkled with a light shower of flaky sea salt and freshly ground black pepper (optional). Don’t worry though, if you don’t have a mixer, you’ll just have a bit of kneading to do. Think of it as good way to build up those guns (arms)! You’ll get the same wonderful results with the crackers, however you can skip the bicep workouts that day; a real win-win! So this one’s for Laurie, Annie … and for you! Make these Lemon Rosemary Flatbread Crackers – asap! I promise, everyone will love them and you just might get some fun, interesting texts too! Oh, and by the way, if you enjoy these Lemon Rosemary Flatbread Crackers, you’d love our Chili Oil Rubbed Flatbread or our Ridiculously Easy Olive Oil Rosemary Crackers. They’re all so simple, inexpensive and the tastes are out-of-this-world! P.S. I mentioned these flatbread crackers are great with hummus. They’re also wonderful with salsas and other spreads. I love serving them with soup as well as with salad. Another fun idea – today for lunch, I spread a small dinner plate with hummus, then topped it with thinly sliced leftover steak, chopped tomatoes, halved Kalamata olives, diced Feta cheese and finely chopped fresh cilantro. I finished it off with a drizzle of olive oil, a squeeze of fresh lemon juice and a sprinkle of sea salt and freshly ground pepper. 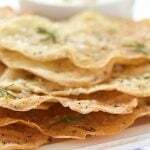 Served with these crisp, Lemon Rosemary Flatbread Crackers, it made a wonderful, light (and super delicious) lunch. 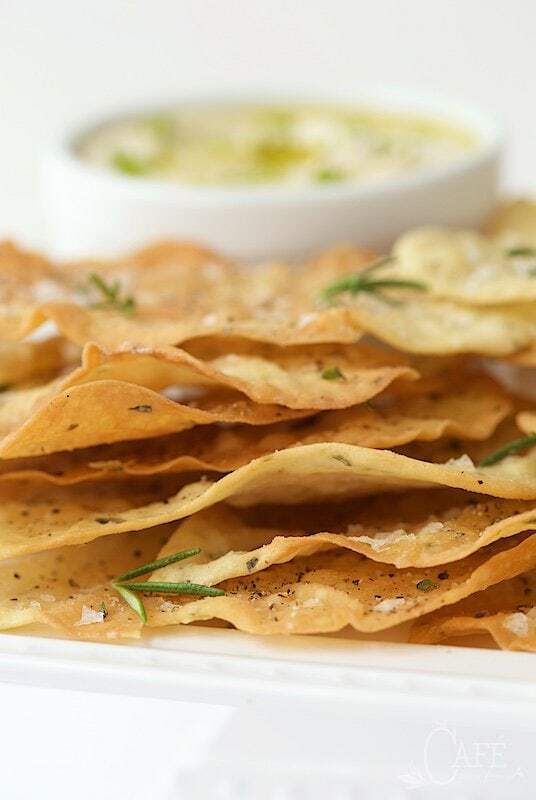 Everyone goes crazy over these shatteringly crisp crackers bursting with lemon-rosemary flavor. They're perfect with hummus and dips but also pair well with salads and soups. Combine water, yeast and sugar in a measuring cup and stir to dissolve. Let sit for about 5 minutes to activate yeast. It will become foamy and bubbly when it's activated. If this doesn't occur after 5 minutes, your water may have been too hot or not warm enough. You want it to be between 110˚F and 115˚F, which is fairly hot to the touch but not so hot that it's uncomfortable. 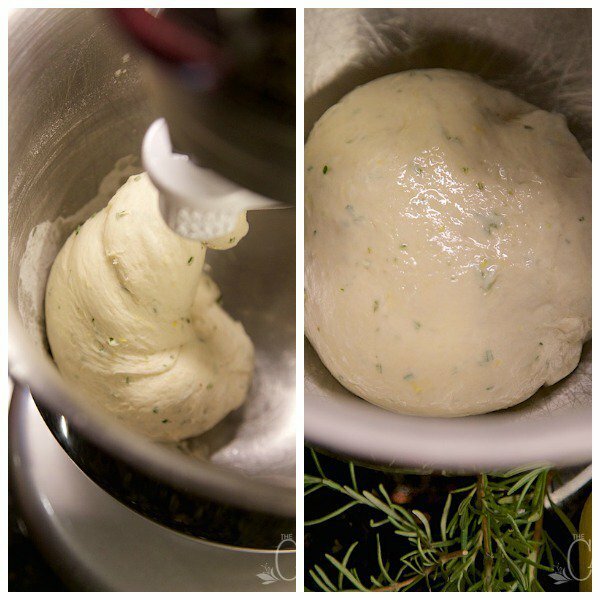 While yeast is activating, combine flour, lemon zest, rosemary, salt and oil in the bowl of a stand mixer. When yeast mixture is foamy add to flour in mixing bowl. Attach a kneading hook and knead for about 5 minutes. Dough should come together and form a ball. If too loose and it doesn't form a ball, add a bit more flour (just a teaspoonful at a time), if too stiff add a bit more water, (a few drops at a time) until a ball forms. f you're making these flatbread crackers without a mixer, combine flour, lemon zest, rosemary and salt in a medium size mixing bowl. Add oil and activated yeast mixture and stir until well combined with a sturdy wooden spoon. Turn mixture out onto a floured work surface and knead until a ball forms. Continue to knead for another 6-8 minutes until dough is smooth and no longer sticky, then proceed with recipe as directed below. Drizzle a teaspoon of olive oil over dough ball and turn to coat. Cover mixing bowl with a clean kitchen towel and set in a warm place to rise. When dough has risen double in volume, punch down and turn out onto a well-floured work surface. Knead dough for 15-30 seconds, just to coat with flour. Preheat oven to 325˚F. Line 2 or 3 sheet pans with parchment paper. Pinch or cut off peanut (in the shell) size pieces of dough, about 36-48, depending on size**. You can go a bit bigger or smaller (for more bite size crackers). With a flour coated rolling pin, on a well-floured surface, roll each piece of dough till paper thin*, turning several times to coat with flour. When you think it's paper thin, roll one or two more times. The secret to rolling this thin is to keep your rolling pin an d work surface well-floured, otherwise the dough will be sticky. Also rub rolling pin with flour between each piece of dough to remove any small dough bits that may have stuck. 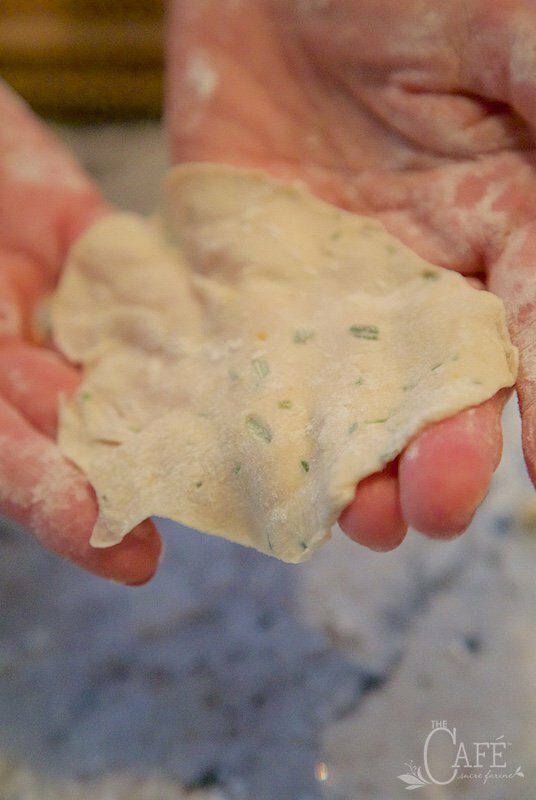 Transfer rolled dough pieces to prepared sheet pans and brush lightly with olive oil. Hold on to one corner of the dough as you brush each piece with oil. Scatter lightly with flaky sea salt (or kosher salt) and freshly ground black pepper (if desired - you can just use sea salt if you're not a huge pepper fan). Bake crackers for 10-13 minutes, rotating pans half way through or until golden brown and crisp. Remove from oven and transfer to cooking racks. Repeat with the rest of the dough, allowing pans to cool between baking. Cool completely and store in a airtight container. Will keep well for up to a week in an airtight container. Yields 36-60 crackers, depending on size. * Recipes with yeast will often use the term "dissolve yeast in lukewarm water. 110-115˚F is NOT lukewarm to me. It's quite hot! You definitely don't want the water too hot, but if it's not hot enough, the yeast won't activate resulting in minimal rise. That's why I suggest using a thermometer if you're not used to working with yeast. ** Shape can be elongated or rounded, but they do not have to be perfect. These should be somewhat rustic, irregular shaped crackers. Also crackers can be made larger or smaller. It just depends on how much dough you pinch off. Thanks so much, Sheila. We love them too! Oops. Should have read the comments first. Other folks used pasta rollers. I haven’t baked these crackers but hope to do so soon. I’ve made the Italian Chips olive oil version of your chili crackers several times. I’ve experimented with additions and toppings. I use KichenAid pasta rollers to roll out long tongue shapes to save on work and time. I found the centers got too thin when I used a French-style rolling pin and the middles overcooked. Love the idea of lemon zest. Will definitely be trying this tomorrow. I prefer to leave flavoring (such as Rosemary and finishing salt) on the side, roll out flatbreads in the pasta maker, then press different toppings for variety before baking: black and blond sesame seeds on some, rosemary on others, salt on others, Parmesan and black pepper too. It makes a pretty variety platter of crackers! Really like this recipe. One thing I do differently is to use my pasta roller to roll out the crackers. Use lots of flour and you can control how thin to make them. Works like a breeze.